Hundreds of thousands of snails that grow to the size of a golf ball are not only taking over and eating the Ebro delta rice fields but also threaten to destroy the delta ecosystem. At the moment, the snails have taken over the rice fields on the left bank, occupying a third of the 32,000 hectares of Natural Park, and have begun to spread to the other side. In order to halt their advance and destroy them, the farmers have applied the drastic measure of leaving 9,500 hectares of paddy fields dry for six months instead of the usual three. The measures are supported by the Ebro Delta Community authorities, which through its grants have forced the fields to remain flooded through most of the year and thus promote the habitat of migratory birds. The economic losses are not significant at the moment, but rice farmers fear serious consequences in the medium term if not remedied soon. The ravages of Pomacea insularum, scientific name of the apple snail species identified in the delta, were previously known only in countries of South America and Asia. The snail is one of many invasive species located in the final stretch of the Ebro and a Government report warns of the risk that "Delta will become the gateway for invasive species of this kind in Europe." At present, the rice farmers are in full harvest, which ends in the middle of next month. After a margin of 10 days to prepare the ground, the field drying is expected to start on 25 October. The measure changes the autumn scenery of the delta, as it is usual to leave the land without water from 15 January to 15 April. 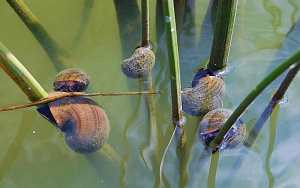 "The goal is to make the Delta totally clean of apple snails," says Antoni Espanya, regional director of the Department of Agriculture in the Terres de l'Ebre. "With this measure and others, we hope to create the most unfavourable conditions for the survival of shellfish," he added. Most of the plague is concentrated in about 100 hectares of the Left Bank. The drying will occur mostly on this side, but is also likely to be implemented in about 900 hectares on the right bank. Last year 4,000 hectares were left without water for longer than usual, but the move did not deter the snails, which reproduce with extraordinary rapidity in the mouths of canals and irrigated fields. Another measure is to change the field drains, because the snails find the best living conditions in them. The measure will affect about 3,500 farmers and 6,000 plots. The farmers are required to install in each of them a new underground pipe with a PVC elbow to impede the progress of the mollusc. In principle the Government will subsidize 50% of the cost, but is considering increasing it to 70 or 80%.